Before August arrives I wanted to talk ‘Christmas in July’. Christmas in July has become a pretty big thing here in Australia. Perhaps it’s down to the climate. Because our ‘real’ Christmas happens as the country bakes through hot Summer temperatures – hardly ideal for red wine by the fire or a hearty roast with all the trimmings. By contrast in July cold weather covers the most populated areas of Australia, giving Aussies the chance to experience those joy-filled Christmas traditions associated with Winter. This year my Christmas in July feast was meat free – thanks to inspiration from Jamie Oliver. 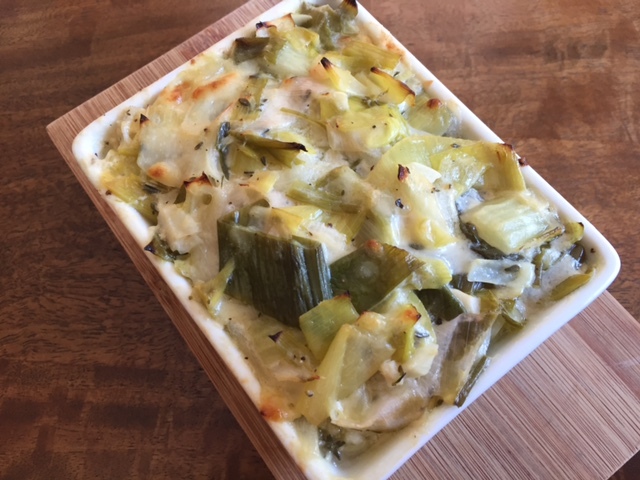 On Jamie’s website I came across an impressive leek and cheese packed vegetarian bake, aptly named ‘Cheesy leeks à la Oliver’. After just a mouthful I was sold on it being a strong contender for this year’s real Christmas Day. Although I largely followed Jamie’s recipe I did make a few tweaks. 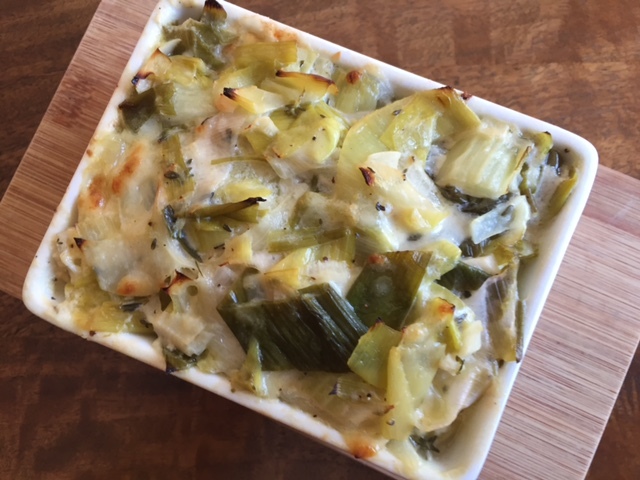 I used two cheeses rather than three (cheddar and Parmesan, but no brie), added a glass of white wine when cooking the leeks and replaced the cream with lighter natural yoghurt. For full details check out Jamie’s Cheesy leeks à la Oliver. Jamie outlines two options for cooking the leeks – go with his advice and cook the leeks for longer in the pan, followed by the shorter cooking time in the oven. It makes all the difference. Rather than one large bake consider making individual single-serve portions, like the ones in my photos. Although the white part of leeks is more tender (because it’s grown underground) this doesn’t mean you can’t make good use of the darker green part. All it needs is a slightly longer cooking time. Do you celebrate Christmas in July? If so I’d love to hear about your Christmas in July feast…. I’m sharing this post as part of Fiesta Friday #182. Your lovely cohosts this week are Liz @ spades, spatulas & spoons and Jenny @ Jenny Is Baking. If you’re keen to join the party then link your post to FiestaFriday.net and the co-hosts’ blogs (full guidelines here). Tags: bake, cheddar, cheese, Jamie Oliver, leek, vegetarian. Bookmark the permalink. Christmas in July! I love the idea. I cannot imagine a summery Christmas since on my side of the world it’s celebrated with roasted chestnuts and hot spicy wine. But it must be nice to see Santa in shorts and exchange gifts while eating in the garden…your baked leeks looks delicious! It reminded me, my mum makes a lovely rolled leek omelette (in 3 colors), at Christmas …. a great family classic. I loved it, I should try to make a vegan version…. Hi Laura, thanks for your lovely words – and yes after 10 hot Christmas celebrations in Australia I find it hard to imagine a cold Northern Hemisphere one – there is something magical about Christmas in the cold that isn’t the same in the warmth. Your mum’s dish sounds great too – you should seek out her recipe…. Christmas in July sounds good to me, makes total sense with the cooler weather 🎅🏻🎅🏻🎅🏻 Christmas in the heat never quite worked for me! This is Jenny from Germany. I was not aware that there is Christmas in July in Australia, but it makes perfect sense to me. I also spent some years in Latin America, in Uruguay and Christmas often was the hottest day of the year. I really found it sad to decorate palms and to have the candles bend due to heat. It was especially sad when I would receive snowy Christmas cards while sweating (no air-conditiong back then) and wishing for some cool breeze. Is there a certain day in July when people celebrate Christmas or can you pick any day in July? Your casserole looks great. Since I don’t see the recipe, I assume it is exactly the same as Jamie Oliver’s? Ok, I saw the tweaks, but thanks for clarifying. Christmas in July sounds wonderful, as does this bake! Christmas in July is big here, too, but it’s mostly for the stores and shopping etc. But I don’t see any reason why we shouldn’t feast, too, lol. That’s good to hear Angie – although how can anyone put shopping before feasting!? I was drawn to this recipe as our local leeks will soon hit the market. It’s really hard for us here up north to wrap our heads around Christmas without snow or cold weather but I would love to experience this one day! Hi Annika, this really this a fantastic recipe if you have some seasonal leeks to use, and as for Christmas in the Sun yes it’s worth trying at least once! Gosh this looks good! What a fantastic dish for Christmas in July! I do know a family here in the US that celebrates Christmas in July (and they buy all their gifts ahead on the big sales days AFTER Christmas! What a gorgeous and decadent dish! Thank you Jessica for your kind words….